Kevin Barnett was an incredible comedian that was loved by many. He lived an amazing life and we’re happy to celebrate his life this Tues 2⁄12 with a night filled with comedy, music & love. This is both a comedy show and a party. All proceeds go to Kevin’s family. Come laugh, cry and most importantly, have fun. 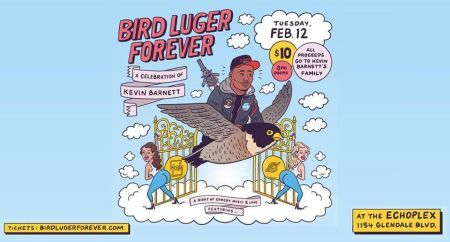 Bird Luger is a way of life and Bird Luger is Forever. Ben Kissel • Beth Stelling • Bobcat Goldthwait • Brooks Wheelan • Ed Larson • Eric Andre • Henry Zebrowski • Jackie Zebrowski • Jak Knight • Jennifer Bartels • Jeremy Burke • Jermaine Fowler • Josh Rabinowitz • Kenny DeForest • Lucas Bros • Mike Lawrence • Mookie Thompson • Nick Turner • Nimesh Patel • Quinta Brunson • Ramy Youssef • The Round Table of Gentlemen • Will Miles + more! $10. All Proceeds Go to Kevin Barnett’s Family. Doors 8pm. Showtime is 9pm.